Rubber Room Ramblings: FUNKY FOUR! Here is another one of the cards we made at our Tuesday Card Club last month. I love this stamp set, and it's new in the 2010-2011 Stampin' Up! Idea Book and Catalog! 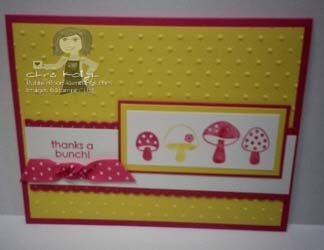 For this card we used some Melon Mambo, Daffodil Delight and Whisper White cardstock. The Funky four stamp was colored with Melon Mambo and Daffodil Delight markers and then stamped on Whisper White cardstock. The sentiment is from the Sock Monkey stamp set. The ribbon is retired, but I loved the little dots, so I used it on my card anyhow :o) I also used the dotted Big Shot embossing folder to add a little texture to my Daffodil Delight cardstock and then added little Dotted Scallop Ribbon Border punches in Melon Mambo cardstock to the edges of my Whisper White cardstock to finish it off. This card is very bright and colorful~~makes me happy just looking at how fun it is!